﻿ Royal Am Rei Hotel, Bacolod (Negros Occidental) | FROM $18 - SAVE ON AGODA! "The place is near pasalubong centers and Restaurant/cafes." Have a question for Royal Am Rei Hotel? "The place is very nice, the food is also good." "Comes with free breakfast, great!" "It was a great day with my family spending it in this very n..."
Residing in the City of Smiles, this contemporary venue offers quality accommodation along with the city’s well-known catering services. 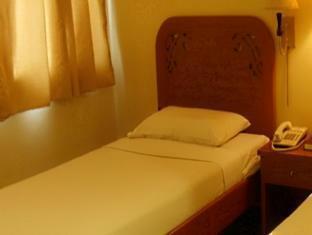 The property offers a wide selection of elegant guestrooms, each equipped with standard amenities as well as toiletries. The property also boasts a meeting venue, perfect for medium-sized conferences. Be sure to try out some of the local cuisines from the on-site restaurant. If you are seeking the ideal base to rest while visiting Bacolod, Royal Am Rei Hotel must surely be placed as one of your top choices. "Staffs were friendly and helpful and the rooms were cleaned..."
The room is clean. The location is good since only few vehicles pass in front of the hotel. Been here several times already. This time there was no hot water in the shower. Overall, the place is a good place to stay. Location is quiet, but a bit of a walk into a dark street. Building facade could do with a new coat of paint, and the bathroom facilities are old but clean and working well. AC was cold. They could have positioned a water dispenser somewhere accessible so guests wouldn't have to ask. My family arrived at the hotel as early as 6am but our check-in time supposed to be at 2pm..We paid P100.00 only per room for early check-in. The place is accessible to pasalubong centers and well known restaurants and coffee shop. Property is very old which might be why it's cheap. We were given the furthest room at 3rd flr, and am too old for that many flight of stairs. And wifi only until 2nd flr, kids are disappointed. Bathroom needs upgrading; it is like an old public toilet, rusting; I don't want to use it. TV is 1980s, with blurry screen; they should remove it to free up the space. But breakfast is okay. The place is very nice, the food is also good. However one thing should be taken care of by the management is putting exhaust fan in their kitchen as every morning, when it’s time for breakfast, the smell of the food scattered all around the hotel which the smell will also stuck on your clothes. It’s one of the major disadvantage. Specially when you’re having a meeting after taking your breakfast, you get concious with your smell and it’s make you uncomfortable.. aside from that everything is totally perfect. We requested for change of bedsheet since it was stained but took them 3days to do it. I wonder if they'll gonna change it if i dont nag and did a constant follow up. No dish out in 2 instances. We always call in advance for them to prepare the breakfast, and they always took the breakfast in the room even though we always remind them that we'll eat in the their respective eating area. We always end up requesting for coffee and water since they don't carry it altogether. The hot water for shower was not available for straight three days. We called the front desk to inquire about it and answered that their house keeping personnel will arrived in 5 mins. No housekeeping staff showed in our door. I reported it at the front desk personally but to no avail. I got to the point of getting the number of the manager and their email address since lots of things are getting out of control. I don't recommmend staying here. I ended up staying three night. Breakfast included and every day there was a different omelet available which was refreshing to see. Unlimited coffee as I sat there with a coup[le who I just met and we talked for hours as the waiter kindly kept refilling our water and coffees. Hotel is very clean, close to everything in town. Staff is extremely friendly and helpful. I defenately would stay there again. All the necessities are here for your stay. Do not expect too much. You can get to the hotel by local transportation and near points of interests. They even extended the courtesy of safekeeping our valuables for a day when we went to Iloilo for one night. Very friendly and helpfull staff. Very low Price but still good quality. Clean and maintained. God restaurant. Only one problem. Wifi is only awaiable outside the room. Some bad thin came on my computer when I used the wifi. Other guests had the same there. Some advertising from SMART that blocked the Whole screen and could not remove. The place is good at night because of the lights and the decorations. The only downfall for me is that the wifi can't reach inside the room and and even mobile data signal is so hard to get when your inside the room. It's somewhat inconvenient for the guests. Needs improvement on the facilities too. Pros: location wise. Walking distance to fastfoods, banks, and bongbong and merci for pasalubong. Staffs are very approachable. They will really help you on your needs. FREE drinking water. There is a water dispenser located in 2nd floor lobby. Just bring your water bottle and refill it for your itinerary. Cons: wifi is only available in the second floor. Some bathroom fixtures are quite old that needs some renovation. No intercom telephone in each room. So if you have some concerns or need to ask the front desk, you need to go down to the lobby to ask. My wife and I did an overnight here after a visa run. Run wasn't really clean, though good mattress on bed. Limited channels on the t.v. Strange odor in the room. Biggest problem was the jackhammer going off in the stairwell first thing in the a.m. So loud we couldn't even hear each other. Staff Indifferent. Couldn't care less. Disappointing breakfast included. Give this place a pass. We go to Bacolod once a month but won't be staying here again. Its a good place to spend the night and the Staff are the highlight of this hotel. It is unfortunately dated and needs to get some updates done. It looks really cool when you enter but once you get into the room thats a totally different story. Staffs are very accommodating and responsive to guests' needs. In my 5D4N stay, they helped me with directions as I went to different tourist spots. Even after I checked out, they still accommodated my things since I have an evening flight. The room we booked for 2 pax is very cheap plus with breakfast. But the WIFI is only at the 2F (we were at 3F). We arrived at night, and the hotel at first was quite difficult to find because you need to walk in a small lane / street, but good this is there were lots of restaurants around the area . I highly recommend this hotel for those who will be staying in Bacolod! Staffs are really nice, and they even helped us booked a taxi for our trip to Silay! And for itenerary - you can ride a tricycle going to The Ruins, and a taxi going to Silay for the Balaring Mangrove and old heritage houses. Overall, my experience with Royal Am Rei is good. 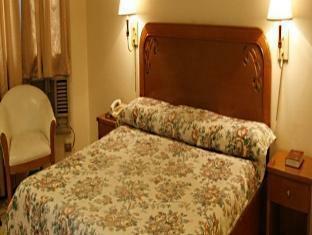 It had a great value for money and the location is the best since it is in the heart of the city. It would have been better if the establishment was able to provide a contact number preferably a cellphone number that is easy to obtain on accessible sites like facebook for the guests (most especially toursits from outside bacolod) to be able to contact and verify the booking/arrangements made. I was able to obtain a contact number through browsing the establishment's facebook page not on the "about'' section but on the comments section from a year ago. See how inconvenient that is for the customer? It would also be nice if there are more food choices to be placed on the free breakfast menu.